http://www.thestoneroses.co interviews photographer KEVIN CUMMINS. What's your favourite Stone Roses song and why ? I don't really have one - it changes constantly - but Fool's Gold always sound great live. You must have a story or two to tell about your adventures and photographing the Roses. Would you be kind enough to share a couple with us today ? 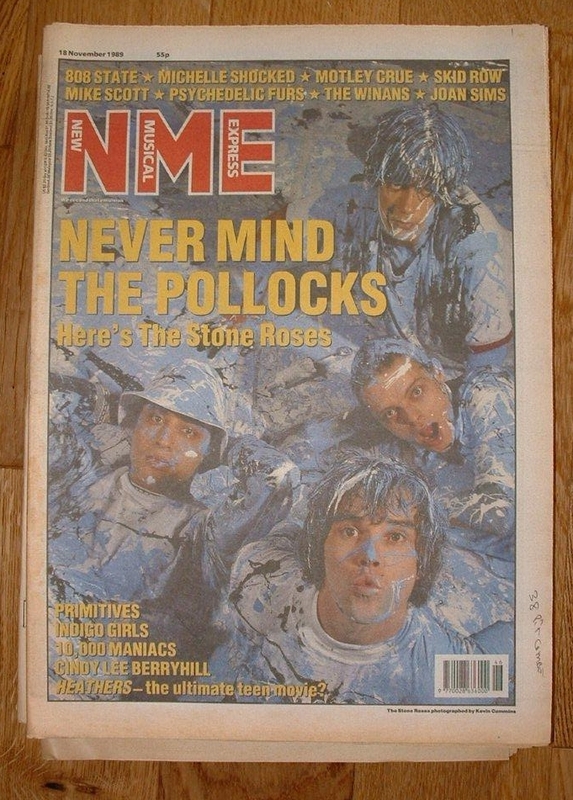 When I shot the photos of the band covered in paint [November 1989 NME session], I didn't tell them there were no showers in the studio until I'd finished the session. They wouldn't have done it otherwise and those photos would never have existed. How have The Stone Roses influenced you and your work and what do they mean to you ? I think I influenced their work. After I did the paint session it 'inspired' them to do similar to their old record company offices. What are you working on now and what's next for you ? I've got an exhibition in Buenos Aires in November, and I'm slowly working on a series of fan tattoos - mainly Joy Division and Morrissey - although if anyone has a good Roses one, get in touch. Do you know any future bands coming through that could achieve what the Roses did ? It's difficult for new bands in the digital age. There's no underground anymore. Everything is instant. Do you have any tips for young musician photographers ? Never give your copyright away. It's your pension. What's your favourite Roses session ? What got you into photography ? I studied it for four years. My father and my maternal grandfather were both keen amateurs and printed their own photos. I learned to do similar at five years old. What would you like to see the Roses do next ? If you could, what would you change about the Roses ? Nothing - surely it's the conflict and characters that makes it all interesting. If our blog readers want to buy Roses photographs from you, what's the best way for them to do so ? What are your fondest memories of the early Roses gigs ? The slightly chaotic nature of them - that never really changed either did it. What's on your iPod at the moment ? What are your memories of Spike Island ? I shot Spike Island from the stage. We all thought it was a great gig. It was only after the show that we were told that the sound was terrible. Seems the only place it was decent was on stage. What reunion shows have you been to ? I went to the Barcelona dates at the start of the comeback tour and I also went to the very special show Adidas put on after the Olympics last year - so I feel quite lucky really. Have you caught up with the Roses recently; how was it ? Good. I'm thinking of doing a book of my Stone Roses photos. If I do, you'll be the first to know.